The great Mac McClelland has a must-read piece in the latest Mother Jones on the epidemic of post-traumatic stress disorder among military families. Yes, families. PTSD is affecting not only returning vets but also their partners and children–and few are getting the help they need. Are all job programs created equal? The Southern Poverty Law Center has filed a sexual descrimination suit against Asheville-Buncombe Community Christian Ministry (ABCCM) of Asheville, North Carolina. The SPLC alleges that women veterans were given unequal access to job training classes, as well as, resident support in comparison to men. The SPLC filed the complaint on behalf of Bagby, an Army veteran, and other female veterans. It details how female veterans are excluded from job training and educational programs provided to male veterans that include truck driving and culinary arts skills. Women have access to classes such as knitting, art therapy, yoga, meditation, how to declutter your room, self-esteem and Bible study, according to the filing. What kinds of narratives exist around the experiences of women veterans? According to the Service Women’s Action Network (SWAN), not enough. That’s why SWAN announced this week that they will honor women veterans this Veterans Day with the launch of a special website capturing firsthand accounts of women veterans. 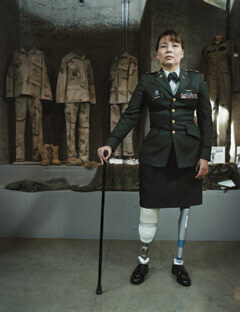 The site, http://www.womenveteransday.org, houses digital stories of women who have served, and will be updated regularly with more women’s stories. Every few weeks a story breaks into the news about homeless veterans. As though our collective consciousness can’t really handle a frequency much greater than that. This week, it’s a story of Kenya Smith, who served in the Navy for 14 years. Smith lost her home to foreclosure recently and joins the 14% of the population in the US that is unemployed. A former lieutenant and medical service corps officer, Kenya Smith first enlisted right after college. She earned two master’s degrees, deployed to Iraq and worked in healthcare and administration. She thought this experience would benefit her upon her re-entry into civilian life. As it turns out, it did not.